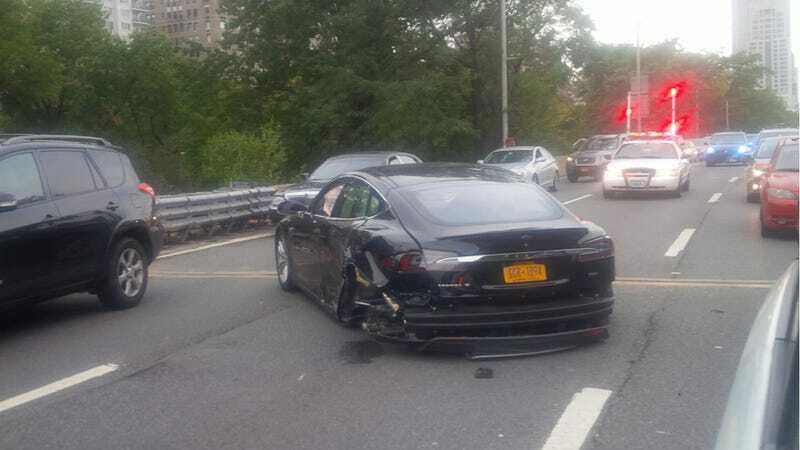 This photo comes via Daniel S., who says he spotted the Tesla Model S on the West Side Highway not far from where the biker attack occurred last week. The force of the crash was so violent that it apparently ripped the wheels from the body. Details are scarce right now and we have no word on injuries, although the passenger seems to be in good shape even though the airbag did deploy. According to Daniel, one of the wheels (the driver's side, I think) was on the other side of the highway as the suspension somehow ripped apart. It doesn't appear to have caught on fire, so that's good. Anyone have more photos or info?